This product is targeted for low cost embedded wireless applications and enables a quick, easy and cost effective method adding Amazon AWS cloud connectivity over Wi-Fi. A sample application configures the Wi-Fi® parameters and illustrates the various ways for a device to interact with the AWS IoT™ platform. 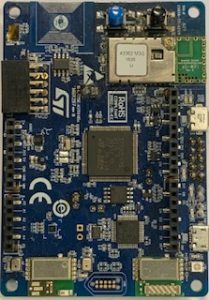 The X-CUBE-AWS software package consists of a set of libraries and application examples for STM32L4 Series microcontrollers acting as end devices. Specific features on the B-L475E-IOT01 board such as measurement of humidity, temperature, 3-axis magnetic data, 3D acceleration, 3D gyroscope data, atmospheric pressure and time-of-flight.